Functional, from dial to case back. ochs und junior offers open-ended customization. This means a client can design a new expression of Ludwig Oechslin’s watches in collaboration with cofounder Beat Weinmann. 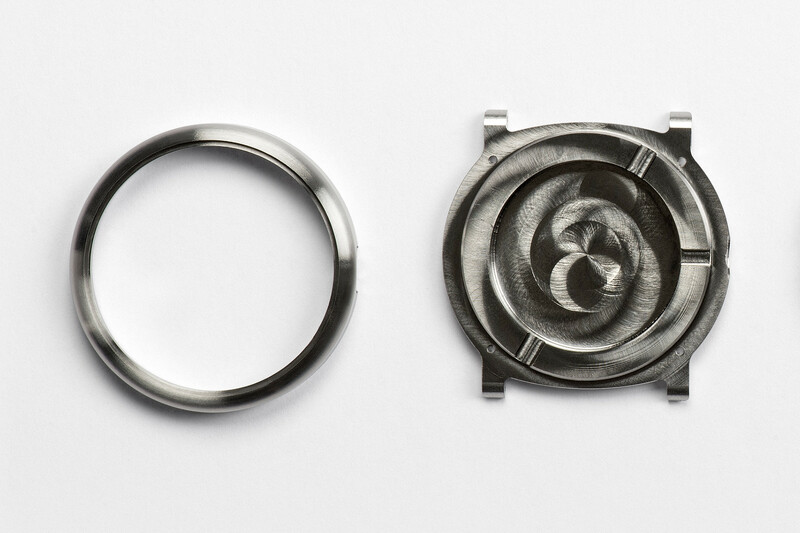 We manufacture about 130 watches per year, and take great pleasure in bringing all kinds of client ideas to life. Many are featured on our website (nebra, rust), and even more one-of-a-kind pieces are worn on the wrists of our clients around the world. Every so often, we are asked to manufacture Oechslin’s moon phase, annual calendar, date, or two time zones watches with a display case back. However, we always refuse this request, and we always will. Why? The reason is a display case back goes directly against the unique concept behind these watches. Oechslin designed his reference watches – the moon phase, annual calendar, date and two time zones – with an uncompromising focus on functionality. This is why they feature intelligent reductions in parts, more useful depictions of time horizons, and no logo or descriptive text on the dial or case. It is also why they are powered by the ETA-2824-2. Oechslin selected this base movement not for how it looks, but for how it works. The Swiss made ETA 2824-2 is a robust workhorse designed to be as reliable, accurate, and serviceable as possible. It perfectly fits Oechslin’s reference watches, which are intended for everyday use. Oechslin’s focus on functionality is furthermore behind the design of the case. 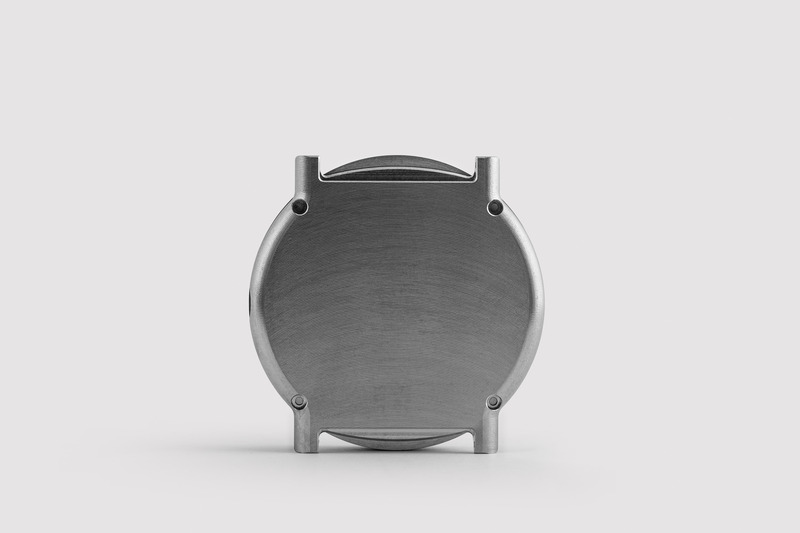 A typical watch case has 3 parts and an inner movement ring to keep the base movement in place. Oechslin’s case has just 2 parts and requires no inner movement ring. 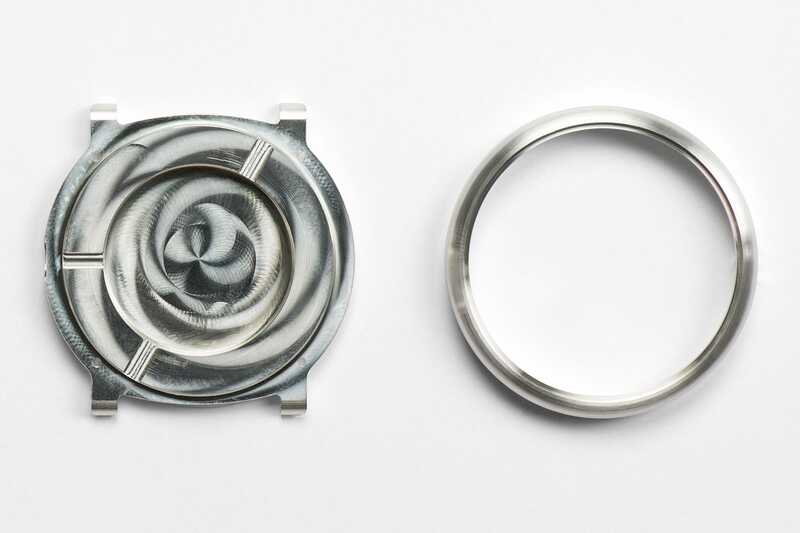 It is precision-milled by Peter Cantieni out of a solid block of grade 5 titanium or sterling silver 925. 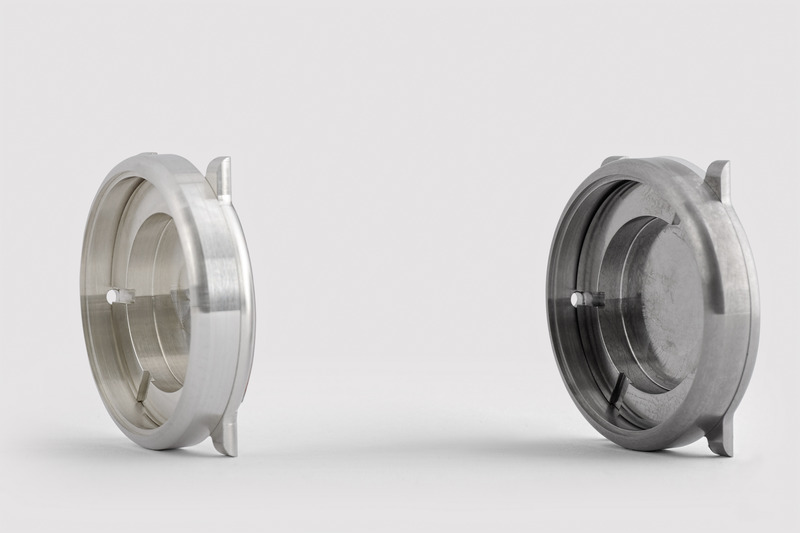 Oechslin designed the case to have less parts so that less sealings would be necessary to achieve water resistance. To punch a hole through Oechslin’s unified concept of practical functionality with a technically unnecessary opening on the last step just makes no sense. A display back would create an additional sealing for a case which was already intelligently designed to minimize sealings. It would also increases the thickness of the case. This is why we exclusively manufacture Oechslin’s moon phase, annual calendar, date and two time zones watches with a solid case back, and jump over the long-running industry trend of display case backs. The anno cinquanta, the first watch from ochs und junior, was powered by a wonderful base movement from the Swiss watchmaker Paul Gerber. It represented a more traditional notion of mechanical watches, cost CHF 46’000 in an 18k white gold case, and provided a view of the base movement. The anno cinquanta paved the way for ochs und junior to think in a more radical and functional way. When Oechslin made the step to his rigorously simple reference watches, the industrial-strength ETA fit their “wear it everyday” concept to a T, as did the solid 2-part case he designed to house them. A benefit of a solid case back unmarred by descriptive text is that the entire surface is available to engrave. It would be our pleasure to offer you an engraving on your ochs und junior with a solid case back.